Josiah Quincy (1772–1864) was serving the second of six one-year terms as mayor of Boston when Gilbert Stuart began this portrait at the request of Eliza Susan Quincy, the sitter’s eldest daughter. 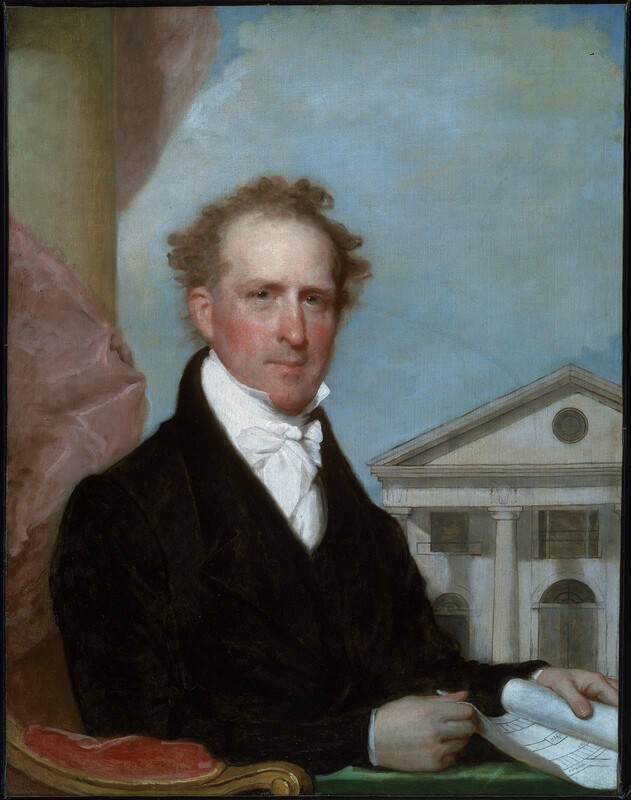 Stuart had painted Josiah Quincy and his wife Eliza Susan Morton almost two decades earlier (1806, Fine Arts Museums of San Francisco and Milwaukee Art Museum), but as Eliza Susan Quincy wrote, she “thought there ought to be another at the age of fifty-two years,” a moment when Quincy had embarked on one of his grandest schemes. Although he served in Congress (1804–13), in the Massachusetts State Senate (1813–20), and as judge in the Municipal Court of Boston (1821–23), and was president of Harvard University (1829–45), it was perhaps as the “Great Mayor” of Boston (1823–28) that Quincy made the largest impact. He instituted many improvements in city life, including garbage collection, street cleaning, and the installation of a water-supply system that dramatically improved public health. The most visible testament to Quincy’s civic career, however, was the construction of Faneuil Hall Market, now known as Quincy Market, across from Faneuil Hall. On the waterfront in one of the oldest parts of the city, the area around Faneuil Hall—which housed a public market, government offices, and a large assembly room—had become overcrowded, filthy, and dilapidated by the early 1820s. Beginning in 1823 Quincy masterminded an urban renewal project to modernize the neighborhood and expand the marketplace to accommodate the city’s growing population. He negotiated the purchase of land and engaged Alexander Parris as principal architect. Parris designed a 535-foot-long (163-meter-long) granite Greek Revival structure capped by a central copper dome for the main market, flanked by two buildings of similar length that would serve as warehouses and stores. When the cornerstone was laid in April 1825, Quincy called it “an ornament to the city, a convenience for its inhabitants, a blessing to the poor, an accommodation to the rich, and an object of pleasure to the whole community.”  The complex was completed in August 1826. The sheet that Quincy holds shows an accurate rendering of part of the overall ground plan of the marketplace. It is unrolled to feature the east end of the complex, the waterfront side, opposite the facade behind him. The lack of symmetry of the whole development is revealed in the differing widths of South Market Street (left) and North Market Street (right) between the structures. The “536 X” inscribed on the center building likely refers to its length (535.6 feet on an 1841 engraved copy of Parris’s plan by William S. Rowson); the “511/3” possibly alludes to the interior length of the main hall (512 feet);  and “creek” scrawled below the North Market marks the site of the Mill Creek, a stream diverted to make room for construction. As Parris’s original plans no longer survive, this is a remarkable, albeit incomplete, documentation of the project. Stuart’s earlier painting of Josiah Quincy (1806, Fine Arts Museums of San Francisco) had fulfilled portraiture’s frequent role as personal, private, and familial. In contrast, this later image presents the public man and proclaims his greatest achievement. As his daughter Eliza requested, Quincy gave this painting to her, and she presented it to the MFA in 1876, just before its opening in Copley Square. 1. Eliza Susan Quincy to Jane Stuart, September 20, 1876, Rhode Island Historical Society, Providence. 2. Josiah Quincy, A Municipal History of the Town and City of Boston During Two Centuries (Boston: Little Brown, 1852), 418. 3. Eliza Susan Quincy to the Trustees of the Museum of Fine Arts, Boston, June 2, 1876, Archives, Museum of Fine Arts, Boston. 4. Carrie Rebora Barratt and Ellen G. Miles, Gilbert Stuart, exh. cat. (New York: Metropolitan Museum of Art, 2004), 327. 5. Boston Landmarks Commission, Quincy Market, study report (Boston: Boston Landmarks Commission, 1996), 6.